What do you get when you combine BuddyPress and Google Location API? A brand new exciting plugin developed by Bravenewcode that allows users to search other users within a specified distance. BuddyPress Geo utilizes Google’s location API and converts your users’ addresses into latitude and longitude. This plugin makes it possible for you to develop custom member directories based on location. There are a lot of possibilities when you use this plugin in combination with a BuddyPress site containing users that fall into categories such as businesses, bands, freelancers, dating websites, education directories, etc. If you had plans to implement a location-based search functionality on your site, this plugin will save you loads of time in custom development. After you install BuddyPress Geo, you will specify the field that represents users’ locations. Configure the Group and Field names for the location profile information in the options panel, and the plugin will index users by location for searching. There a few more simple steps to get it set up on your site, so I would suggest checking out the detailed instructions linked below. 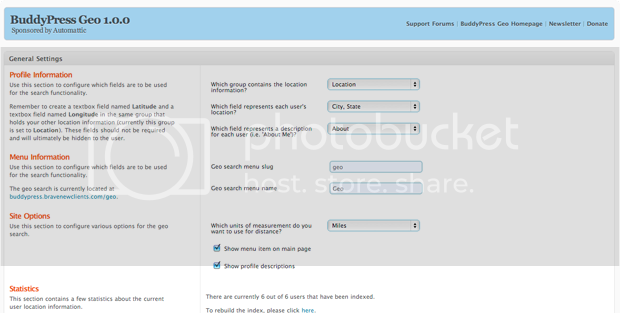 In a matter of minutes you can have your site configured to search members by location. This is a brand new feature worthy of an announcement to your users. This should increase the usefulness of your site and the amount of time people will spend there. Hats off to Bravenewcode for a fantastic contribution to the BuddyPress community!